Minneapolis, MN – The YMCA, a leading nonprofit dedicated to strengthening communities through youth development, healthy living and social responsibility, will celebrate the grand opening of a transformative new Equity Innovation Experience developed with the Science Museum of Minnesota and community partners from 11 a.m.-7 p.m. on Tuesday, February 5. 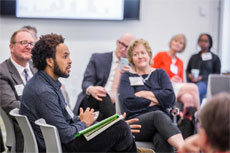 The new Equity Innovation Experience, located in the YMCA Equity Innovation Center on 651 Nicollet Mall in Minneapolis, is a catalyst to engage the mind on equity, diversity, inclusion and global realities. This interactive exhibit used in conjunction with the Center’s programs provides a unique opportunity to see life from another’s point of view and challenge a person’s mental models of the world. Through this immersive learning process participants gain a deeper understanding of the life paths and experiences present today so they can better serve their communities or reach their customers with greater relevance and comprehension of needs. Recently 160 students and staff from North Central University participated in the Y’s Equity Innovation Experience as part of its student leadership development program. The goal of the training was to heighten student cultural awareness and leadership skills in the community. Open house attendees will have the opportunity to visit Y leaders and learn more about the YMCA Equity Innovation Center programs and services being offered for all in the community and tour the new Equity Innovation Experience that is used in conjunction with the Center’s customized programs. They will see firsthand how the experiential learning experience includes hand-opportunities to explore cultural markers, wealth disparities, microagressions, implicit bias and the history of race in America. As part of the reflective process and after going through the Equity Innovation Experience, participants debrief and connect with a small group about personal experiences and its impact and how to lead differently going forward. During the open house there will be a special session What Do You See? with renowned photographer Wing Young Huie at 4:30-5 p.m. with questions and answers following. Huie will discuss his collection of photos featured in the Equity Innovation Center that challenge participants to learn the backstory that will complicate and challenge initial perceptions, opening up perspectives not considered. He will examine how when people look at photographs it shows them how they look at each other. Special Session: What Do You See? featuring renowned photographer Wing Young Huie at 4:30-5 p.m. with questions and answers following. For more information and to register for the YMCA Open House Celebration of the New Equity Innovation Experience, visit https://www.ymcamn.org/eicopenhouse. For more information on the programs and services offered at the YMCA Equity Center, visit https://www.ymcamn.org/EIC.